Step out of your comfort zone & visit VIETNAM! Hanoi is a blend of Western and Asian influences with its exhilarating vibe of noisy street markets, humble pavement cafes, lush parks, ancient & well-preserved temples, timeless alleys and charming old french architecture. 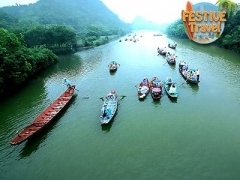 Full of limitless energy, you will be pulled along for the one ride you definitely do not want to miss at Hanoi. The must-see sights such as the Lake of the Sword Returned (Hoan Kiem Lake), the Ho Chi Minh Complex, the Temple of Literature etc. are within walking distance of the hotel, as are all shopping, banking facilities, as well as eating and entertainment options. At Hanoi City Palace hotel, guests will enjoy a luxurious stay supported by modern facilities & amenities including a laptop with free Wifi internet connection, looked after by a team of dedicated and professional staff.